So Much For Day 4!! Backing up to yesterday, everything was going great until about 4:30, when we decided to stop at a park so Zach could play a little bit. He ran ahead and went straight for the equipment and by the time I caught up, he was climbing up a tower on the back of the structure and I decided I wanted to get a picture of this. I pulled out my phone and hit the camera app and hopped down into the mulch-filled playground area and almost immediately said “Ouch“! I looked down at my big toe on my left foot (I was wearing flip flops) and saw a little ant sitting on top. As I moved my foot to try and shake him off, I must have disturbed the mound, because all of a sudden, these little fire ants were all over my foot!!! 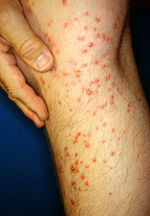 A human leg three days after coming in brief contact with a fire ant colony. It was at this point that the pain of multiple fire ant stings/bites started to hit me and I began to panic. I jumped up into the grass, literally jumped out of my shoes and pretty much freaked out until I got these little beasts off my foot (I don’t even want to know what I must have looked like! LOL!). The redness surrounding the immediate bites was rapidly spreading, so we grabbed a very adamant “I-don’t-understand-why-we-have-to-leave-we-just-got-here” 3-yr old and headed to the H-E-B down the street. My foot was on fire, so I sat in the car while Mike ran in to ask the pharmacist what I should do. He emerged with Benadryl and Neosporin + Pain Relief. The pharmacist said to take the Benadryl ASAP, which I promptly did – I took two tablets. We then headed back towards our house and realized it was about dinner time, so instead of heading all the way home and back out for the errands we still had to run, we decided to stop at T.G.I. Friday’s for dinner. I got the Sizzling Chicken & Cheese entree and substituted the mashed potatoes for broccoli and Mike and I split the classic wedge salad with blue cheese dressing that came with his entree. I figured that was a pretty safe bet for being carb-free, as the entree was literally just chicken, cheese and peppers. By the time we left, I had pretty much launched into orbit from the Benadryl (I don’t know if I’ve ever taken it before) and Mike had to drive. I couldn’t believe how spacey, loopy and just all-around wiped out I was. I barely made it to our next destination without falling asleep. We got home around 7:00 pm and I literally went straight to bed. I did not want to fall asleep that early, because I knew I would be up way too early this morning, but I was pretty powerless to fight it. I was out. So, I woke up this morning around 3:30 am and my foot was stinging, so I got up to put some more Neosporin on it. I tried to go back to sleep, but yeah right, who was I kidding? I found my way downstairs at 4:00 am, made some coffee and sat down on the couch and chatted with Mike (yes, he was already up, which is not unusual). Here’s the bummer; I was STARVING. I mean, really, really starving. To the point of being somewhat nauseous. I actually felt a lot more like I did on Day 1 or Day 2, but this is Day 4! The day that my body has depleted the glycogen stores and I feel great! I ate breakfast at 5 am and it barely did anything to curb my hunger – I had to have a snack by 7 am. It was at this point that I decided to look up the nutritional information for the entree I had at Friday’s. Oh. My. Gosh! Wow, those restaurants hide calories everywhere, dont they? Isn’t that the truth!? And it seems that everything they serve that has lower calories has a ton of sugar. I’m quickly realizing that eating out is just not the best option and should be done only occasionally. Also, I REALLY need to do my research before choosing a restaurant/meal. Remember School House Rock… “Knowledge is Power” haha, I never knew they were referring to restaurant food and weight loss. No kidding! But sooo true!! That’s one of the few things I don’t miss about Texas — the fire ants! They are aweful!! !